Ross Video announces its new generation of large production switchers will be introduced to the European market at IBC 2014 on Stand 9.C10. 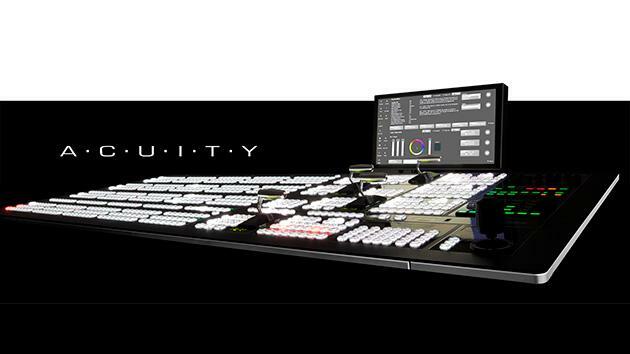 Acuity offers a breakthrough in modern production switcher technology, combining seemingly limitless production power with aesthetic beauty and unprecedented connectivity. Customers for Acuity have a number of choices; there are six control panel variants with one to four ME rows and two sizes of rack mounted processing engines. Acuity’s signal processing accommodates all current production formats including 1080P 3G and UHD (4K). It includes some very innovative features such as DVE key combiners and up to 12 DVE’s per ME, that’s 10 channels of 2D and 2 channels of full 3D, making it easy to produce complex ‘box’ shots on a single ME. Its Custom Controls (a combination of powerful macro’s with timelines) make it simple for operators to quickly create or edit complex events, allowing greater efficiencies during show setups and operation. Acuity is also the best-connected production system in the world. It is fully integrated with Ross Video’s OverDrive APC system and Dashboard system-wide control manager, and offers the industry’s largest library of third-party control protocols. It also integrates seamlessly with Ross XPression Graphics Systems, BlackStorm Video Servers, Ross Camera Robotics and Inception News and Social Media.